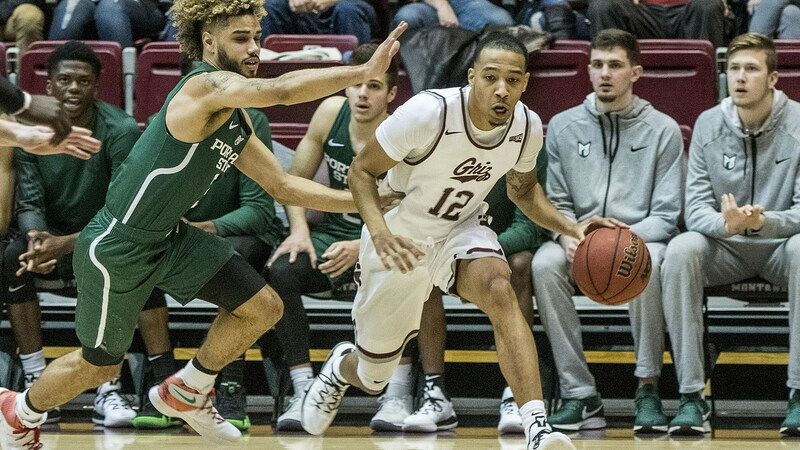 Montana’s 20-game home winning streak came to an end Saturday night, as Portland State overcame a seven-point deficit in the final 2 minutes of regulation to force overtime, before winning 77-74. Montana took a five-point lead into halftime before scoring six of the first eight to open the second half and going up by a game-high nine points. The Grizzlies’ led by at least two possessions until the 10:31 mark, but after Portland State got within three, the Grizzlies quickly pushed it back to a seven-point advantage thanks to four straight points from Kendal Manuel. Portland State got within one, 58-57, with 5:55 to play, but again Montana was able to counter, holding the Vikings without a made field-goal for more than 3 minutes and pushing the lead back to seven, 69-62, with 2:16 to play. That would be the final time Montana would score in regulation, as the Grizzlies missed both shot attempts and turned the ball over down the stretch. Portland State was 2-for-2 with two made free throws, tying the game with a Holland Woods triple with 40 seconds to play. In the overtime period, Montana struck first, with Sayeed Pridgett driving to the hoop just 13 seconds in, but the Grizzlies couldn’t find the bottom of the net again until a Jamar Akoh made free throw with 1:19 on the clock. Montana had two shots in the closing seconds to tie the game, but neither would fall, a trend that stuck with the Grizzlies during the second half of play. After shooting 56 percent from deep in the first half (5-of-9), Montana went 0-for-15 from three-point range in the second period and overtime. The Grizzlies were led by Manuel’s career night. The Billings native scored 22 points, including a perfect 10-for-10 mark from the free-throw line. Akoh narrowly missed his second consecutive double-double, finishing with 14 points and nine rebounds. Montana’s last home loss came Feb. 16, 2017. The Grizzlies’ 20-game home winning streak was the third-longest active streak in the nation and was the fifth-longest streak in school history. Portland State’s 73-71 lead with 2:46 to play in overtime was its first lead since the 9:15 mark of the first half, when the score was 18-16. Portland State entered the contest leading the nation with 18.7 offensive rebounds per game. The Vikings were held to 13, two fewer than the Grizzlies. Overall, Montana out-rebounded Portland State, 40-39. Montana recorded an assist on each of its first nine field-goal makes. The Grizzlies held Portland State to 39 percent shooting in regulation, but Montana – ranked 22nd nationally with a .494 season shooting percentage – shot .390, with no player over 50 percent from the floor. Senior Bobby Moorehead had a career-high four assists, in addition to seven rebounds. Senior Michael Oguine scored 15 points, marking the sixth consecutive game he has been in double figures for scoring. Montana turned the ball over just 10 times, resulting in five Portland State points. There were a combined 44 fouls called in the game, resulting in 60 free throws. Four different players made a three-pointer, but none were Oguine or Ahmaad Rorie (Montana’s two leaders for three-point makes). Montana was playing its fourth game in eight days to begin Big Sky play. Montana will now play its next three games on the road, beginning with a trip to Cheney, Wash., to play Eastern Washington on Thursday. Across the league, Weber State – picked to finish second in the Big Sky preseason poll – lost at home in overtime to Southern Utah. Northern Colorado – picked to finish third and Montana’s opponent next Saturday – also went to overtime, narrowly edging Idaho.